Glorfindel (S. ‘Golden-haired’) was an Eldarin lord of Gondolin, and Chief of Gondolin’s House of the Golden Flower. Given his golden hair, it was probable that he was of the House of Finarfin. During the Nirnaeth Arnoediad, Glorfindel commanded the left flank of the retreat of the Gondolindrim. When the city of Gondolin fell, he accompanied Tuor, Idril, and the other survivors in their escape; but the Company was ambushed in Cirith Thoronath, and Glorfindel died fighting the Balrog who led the attack (also killing the Balrog in the process). * Note: there are two Elves with the name Glorfindel in Tolkien’s writings – a Glorfindel of Gondolin and a Glorfindel of Rivendell. When Professor Tolkien wrote The Lord of the Rings, the two were not one in the same; however, Tolkien, unhappy with this oversight, reconciled the two characters by sending the spirit of Glorfindel of Gondolin to the Halls of Waiting, where, for all his noble deeds, he was later re-embodied by the Valar, becoming Glorfindel of Rivendell. Upon his re-embodiment, Glorfindel spent several hundred years in Valinor, during which he became a friend of Olórin (Gandalf). 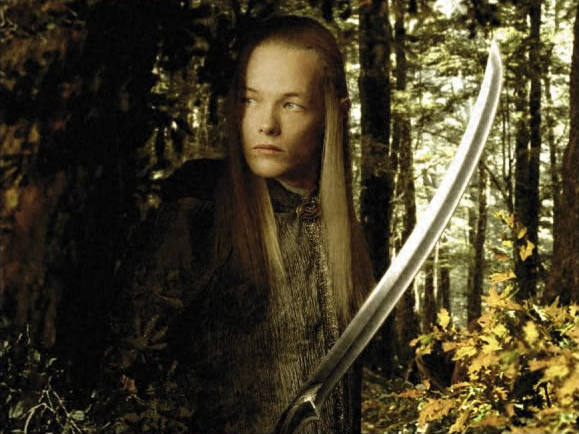 He was sent by Manwë to Middle-earth to aid Gil-galad and Elrond in the fight against Sauron. During the time of the War of the Ring, Glorfindel was perhaps the second most important Elf in Rivendell, after Elrond. He led the force of Elves in the Battle of Fornost (TA 1975), where he famously prophesied that the Witch-King would not fall at the hand of any man, and in TA 3018 he was sent by Elrond to find the Ring-bearer. It was he who put Frodo upon his great white steed, Asfaloth, and carried him safely across the Ford of Bruinen. When they had reached the other side, Frodo faced the ensuing Ringwraiths, openly defying them; Glorfindel revealed his powers to the Nine, who were swept away by the roaring waters of the River. He then bore Frodo to Rivendell, where his wounds were tended to by Elrond. Glorfindel is not mentioned during the War of the Ring, but he later appears with Elrond and Galadriel at the Wedding of King Elessar. After this, no more is said of him. Thank you for this great blog of Glorfindel, answered all my questions about this character. wow never knew this about Glorfindel !! !